Some people have a love of peanut butter. I am not one of those people. My interest in it waxes and wanes. I enjoy peanut butter when I have it, but I will almost never choose it over a good, pure vanilla or dark chocolate or cinnamon or lemon or berry. I feel sorry for Alex when we share a dessert, because peanut butter is usually in his top three choices of desserts/ice cream/what-have-you to order, and I veto it 9 times out of 10 in favor of something else. However, today is Alex’s birthday. (Happy birthday, Alex!) He knew I was going to make him a cake, but I kept the flavor a surprise. I let it leak that it was chocolate when I debated buying a replacement bar of baking chocolate at Trader Joe’s, and I even made the chocolate layer cakes while he watched TV on Saturday morning. 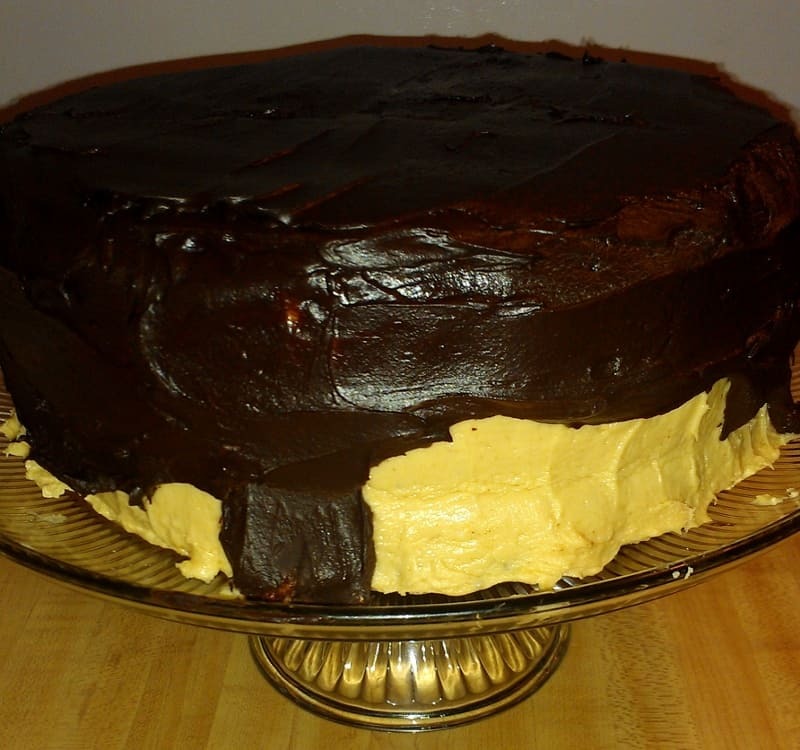 But when it was time to make the peanut butter cream cheese frosting, and chocolate peanut butter ganache, I banished him to the basement, where he willingly went to listen to music and do some organizing he’d wanted to do for a while. I covered my tracks relatively successfully by making a curried Chex Mix to mask the rich smell of peanut butter in the kitchen, and stored the cake in the fridge, which Alex avoided to keep the flavor of the cake a surprise. The Chocolate Peanut Butter Cake was a hit. It was incredibly easy to make, and well worth the time spent making it. Half of this cake fed 8 people, and could have fed even more if I could have cut slices smaller. I made the ganache right after frosting the cake, and left it to cool while the cake chilled. This was a mistake, because it made the ganache thicker and less pretty. After the cake chilled for 30 minutes, I poured the ganache over the cake, spreading it down the sides of the cake. The ganache spread okay, but my spatula left swipe marks in the ganache. Not that anyone minded. I chilled the cake, removing it from the fridge about 45 minutes before serving. 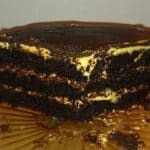 This recipe had a few steps – cake baking, assembly with frosting, frosting with ganache – but was incredibly easy to make. The cake took only a large bowl and a whisk, and took no longer than 45 minutes to mix and bake. The frosting was very quick to make – just a few minutes in a stand mixer. Assembly was unfussy: the cake layers were very flat, so I didn’t have to trim them before frosting. The ganache is the only potentially difficult thing, because there’s a possibility you could scorch the chocolate. If you’re worried about that, use a double boiler like Deb at Smitten Kitchen originally wrote into the instructions, or heat in the microwave, stirring every 15-30 seconds until the chocolate is melted. You could skip the ganache entirely, although I recommend against it if you’ve got an extra 30 minutes to let the cake cool after you top it. It’s definitely worth making. As I said before, the cake was incredibly rich. 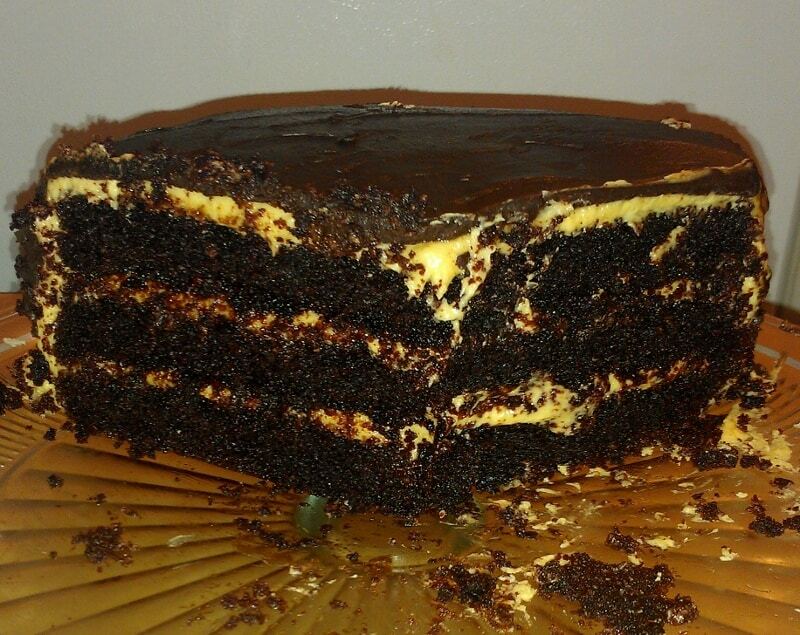 The chocolate cake was rich and moist on its own. The peanut butter frosting was sweet and peanuty; I used every excuse I could to eat some of it while I frosted the cake. The same is true of the chocolate peanut butter ganache; it was dark and chocolatey, and I would actually consider using a less dark chocolate (chocolate chips or 60% chocolate, perhaps) for it next time. All the components of the cake were good separately, but they were amazing together. Eight of us ate half of the cake, but some people couldn’t finish their cake. I’d say you could probably feed 20+ people with this cake. Not bad for a few hours of work! Honestly, I think this cake is incredibly presentable, and seems much more difficult to make than it was. This cake will make a peanut butter lover incredibly happy. I can’t recommend it highly enough. Want other chocolate peanut butter sweets? Try Chocolate Peanut Butter Cheesecake, and these healthy Chocolate Peanut Butter Bites. Mix together flour, sugar, cocoa powder, baking soda, and salt. Add oil and sour cream, and whisk to combine. Add water, vinegar, and vanilla, and whisk to combine. Add beaten eggs and whisk to combine. Distribute evenly between three 8-inch or 9-inch (which I used), greased and floured cake pans and bake at 350F. Mine were done at 23 minutes in my very hot oven; Deb at Smitten Kitchen says 30-35 minutes. Let cakes cool completely before assembling the cake. Cream together cream cheese and margarine with an electric mixer until well combined. Add powdered sugar 1 cup at a time, scraping the bottom occasionally. (The original says to beat until fluffy, 3-4 minutes. I forgot this step.) Add peanut butter and mix until well combined. Freeze cakes for 30 minutes before assembling (per original recipe). However, I cooled my cakes in the pans and just popped them into the freezer right before making the frosting. When assembling, I took a cake from the freezer, turned the cake out into my hand, and settled it on my cake plate, bottom side up. 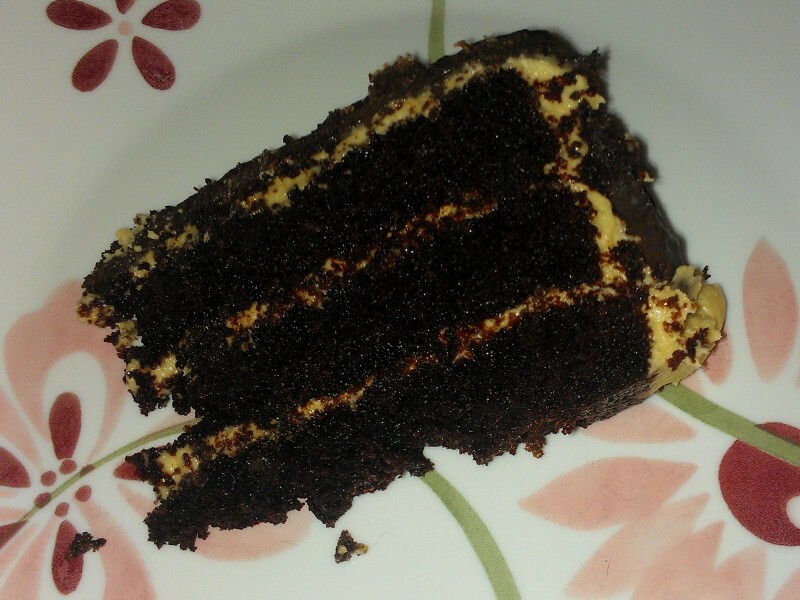 I frosted it with 2/3 cup of frosting, and repeated the process with the second and third cake layers. I put a thin crumb coat of frosting on the top and sides of the cake and put it in the fridge to chill to make frosting the rest of it easier. 15 minutes later, I applied the rest of the frosting to the cake, and put it back in the fridge to chill while I made the ganache. Combine 8 ounces chocolate, 3 tablespoons peanut butter, 2 tablespoons corn syrup, and 1/2 cup half and half in a saucepan and melt over low heat, stirring constantly. Adjust heat so the chocolate doesn't burn. Mix until chocolate melts and ganache is thick and smooth. Pour on chilled cake while ganache is warm.